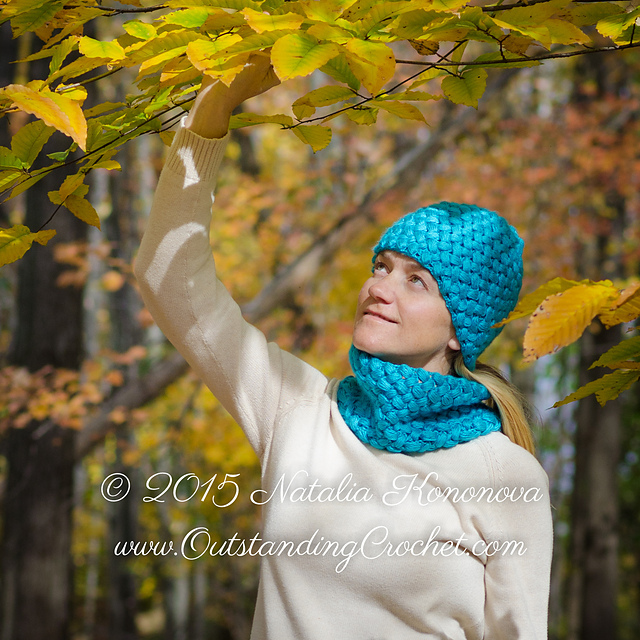 Outstanding Crochet: Puff Stitch Crochet Hat and Tube Scarf Set Pattern in the shops - New. 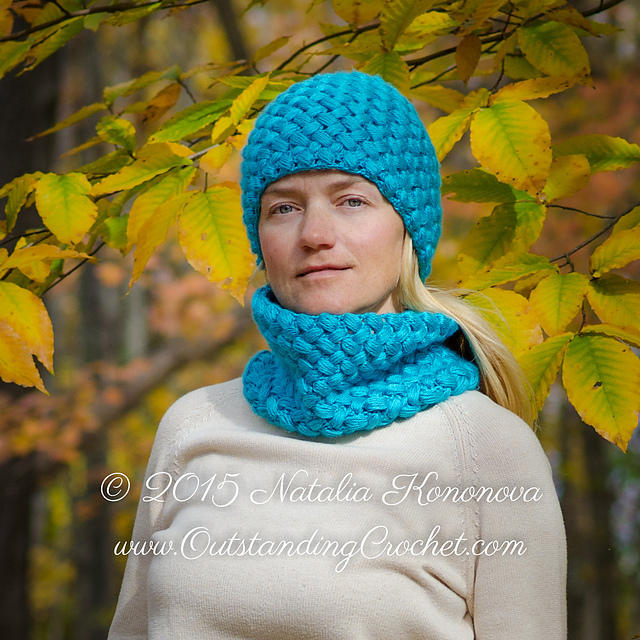 Puff Stitch Crochet Hat and Tube Scarf Set Pattern in the shops - New. I just added this pattern in the shop and so exited to have this set for myself! As always you'll find step-by-step pictures, written instructions and charts in my pattern! See this pattern in my Ravelry shop. Thank you! happy crocheting, my friends! Snuggle in this very warm set. 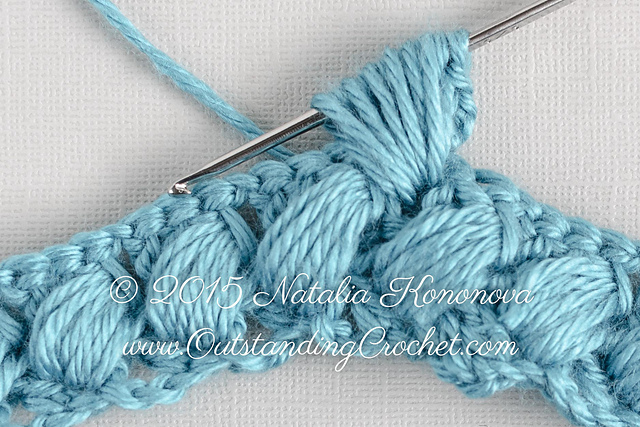 ch (chain), sl st (slip stitch), dc (double crochet), puff stitch (or learn in the process, step-by-step pictures will lead you). tune scarf is 7” (18 cm) tall and 22 ¾ / 58 cm in circumference. 4.5 puff sts x 8.5 rnds = 4'' x 4'' (10 x 10 cm). It is not allowed to sell finished items based on any of my patterns. All photos and diagrams are copyrighted and all rights to this pattern are owned by Natalia Kononova. Do not copy, share, resell, or forward this pattern to anyone. No part of this work may be reproduced, transmitted or published in any form or by any means without prior written permission. Use of any photo or video material or link to a photo for commercial purposes that belongs to Natalia Kononova is strictly prohibited. Why would you not allow sales of finished products of your patterns that you sell? First of all, hello Brenda! Thank you for your interest and leaving a comment! When you think of it, it takes a whole bunch of time and effort to make a pattern. I sell it let's say for $5. Somebody who would make a finished project based on my pattern, would pay $5 and make more than $5 on each item. Of course this person wouldn't get rich making it. :))) But if designer sells her pattern to a magazine she would get at least $300-500 for it and often doesn't loose her copyright. if designer sells her pattern to a manufacturer for a mass production, she would get way more for it. Why designers do otherwise, I do not know. I am sorry, but this is the way it is. This is a huge amount of work to create a pattern. If writer comes up with a book, he or she gets royalty from each copy. And this is the right thing. Buying a pattern for $5 and selling finished items seems wrong to me. $5 - is a price to make one or more copies for yourself or as gifts. I can give the permission it I talk to the person, get to know her and her situation that led to making money by this hard work of crocheting for sale, I can give my pattern as a gift, but my default setting is I don't give permission to sell finished items. Intellectual property is a property first. Best regards to you! If you are interested in this pattern, please, let me know. I edited my first response, I was thinking of it all day and discussed the topic with fellow designers. Your set looks great ! !